My favorite little vintage shop wasn't open. The downtown of this college town is severely lacking in antique and thrift stores since the really big antique store closed last fall. Salvation Army is currently moving to a different building, so they weren't open. But I did find a bit of treasure! I've been needing a mirror for a certain little spot in my bedroom. And at Goodwill I happened across a wooden mirror similar to the one pictured above---just smaller! It's adorable. I bought it with the intent to paint it or make it over or something. But once I hung it up on my wall, I realized that it adds just the right touch of rustic to the ultra-feminine corner. For some time, I've also been meaning to replace a lampshade I've grown tired of. While I'd love to get my grubby little decorator hands on a gorgeous mercury glass base like the ones above, I'm quite happy with the ornate gold lamp base I currently have next to my bed. It's tall, skinny, and just a little gaudy. I'd been using a rather Victorian looking ivory, fringed lampshade. I was planning on replacing it with something simple, sleek, and crisp white. Instead, I ended up with a burlap one. The contrast of vintagey gold and natural fiber makes my heart skip a beat. I love the soft glow of light that it creates. And it goes splendidly with my burlap pillows. 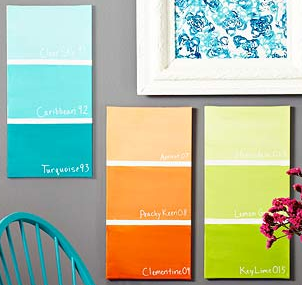 These colorful paint chip canvases I whipped up were featured in the Spring 2012 issue of Do It Yourself magazine. Now, they add a brilliant burst of color to my bedroom wall. These colors---turquoise, orange, green---are repeated throughout my room, with some heavy doses of red thrown in, too. Hi Jessica! This comment doesn't have anything to do with this post (though I do love those lamps! ), but I wanted to let you know I used the Visa gift card I won during your internship attire contest for the first time today to buy a latte! I know you're a coffee aficionado, so I thought you'd appreciate that. :) Thanks again for picking me as the winner!